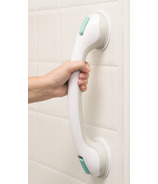 Bath Safety Rails & Grab Bars help mobility and improve bathroom safety. 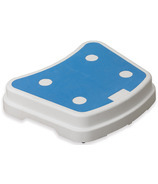 Bath Safety Rails improve bathroom safety by providing balance while standing or providing leverage when sitting down or standing up in the shower. Products like the Drive Medical Angled Chrome Knurled Grab Bar can be permanently mounted with screws while products like the Bios Suction Grab Rail is totally portable with its suction grab piece.